One person has been killed and another seriously injured in an explosion at a military hardware factory. 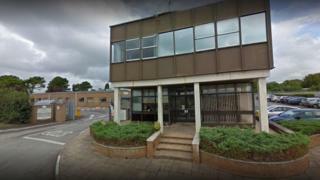 A fire broke out in a building where flares are manufactured at the Chemring Countermeasures plant in High Post, Salisbury, at about 17:00 BST. Wiltshire Police said one person died at the scene and another was taken to hospital in a serious condition. A spokesman said the fire had been contained and there was no risk to people living in the local area. He said: “An initial fire on site has been extinguished. We have two casualties that have been identified. Next of kin have yet to be informed, the spokesman added. Chemring Group business director Andy Hogben said: “The site was immediately evacuated and the incident brought under control. Chemring has launched an investigation into the cause. Products manufactured by the company include flares, chaff, and decoys for use on aircraft and ships. Wiltshire Police and the Health and Safety Executive are to conduct an investigation into the cause of the explosion. Six fire crews, the ambulance service and police all attended the blaze.